What Is Social Media Canvas? Social Media Canvas is a one-page social media plan. This one-page canvas gives "main street" businesses a simple way to plan out an overarching social media stratgy without having to know the ins and outs of social media marketing. Social Media Canvas helps you tell better stories, leading to more sales from social media. Why Create a social media plan? Social media is a complex ecosystem. Having a written plan of action for social media enables organisations to grow and connect with their audience so that they can take action. A plan produces consistency, cohesiveness, and scalability while avoiding conflicting messaging, overuse, and out-of-tone posts. Why Use The Social Media Canvas? Social Media Canvas is the a good balance of complexity and simplicity, leading to a social media plan that takes 20% of the work and leads to 80% of the results. While the Canvas is designed specifically for "main street" businesses it has been found to help larger organisations start and ground a more intricate conversation about social media. Why does Social Media Canvas Work? All of the major aspects of social media marketing are addressed within the Social Media Canvas in a flow that builds on itself. This, combined with the constant feedback and refinement system Social Media Canvas is still going through, enables "main street" businesses to create "wall street" level social media plans. Who Created Social Media Canvas? A step-by-step guide to create a one-page social media plan using Social Media Canvas. Here is a quick overview of Social Media Canvas. It's hosted by Spencer Field, the originator of this idea. Social Media Canvas comes with a connected Guide on how to fill out each section. You can get that Guide by saving the following image, downloading the PDF below, or check out a condensed version of the Guide steps below. 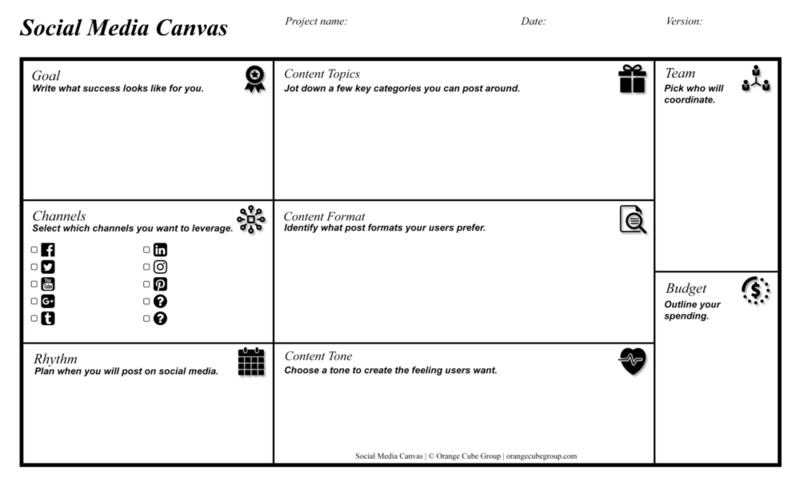 Download the one-page social media plan called Social Media Canvas. Ready To Download Social Media Canvas? Social Media Canvas is free to use, distribute, and edit for both personal and commercial purposes. The only rule we have is that you provide a link to this website and drop us a comment letting us know how you are using it in the comment section below. Here are a few versions of Social Media Canvas you can use. Comment if you would like to see another format.